Just Married - Please Excuse - Book Review ! What happens when a MBA fresh out of B school falls in love with her senior at work and they decide to tumble into the land of holy matrimony after just three months of courting – mayhem and loads of fun ! This is what Just Married Please excuse is all about! Written By Yashodhara Lal who blogs at Y on earth Not ! 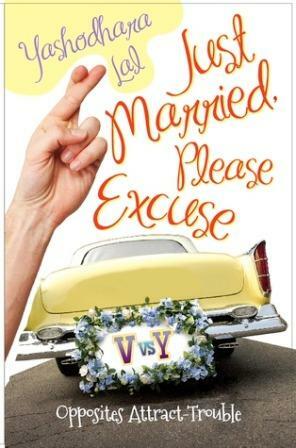 Just Married Please excuse is a roller coaster ride of a young couple into marriage and then parenthood. The main characters are Y – the modern, willful and slightly strong headed girl from Delhi who falls in love with the much older Vijay from small town Jaipur. The book covers their journey right from their first date – where they drive 5 hours one way to “feed the ducks” to marriage and then on to the birth of their first child. It’s not only a tale of two couples from diverse backgrounds falling in love but also of the changing life styles in urban India and how a young marriage survives the changing times and two demanding careers! There is no riveting storyline here, nothing to keep you on tenterhooks.This book is just a series of anecdotes from the couple's life.A lot of married people are going to read this book and shrug their shoulders and say something like "been here done that!" However, what saves this book from being mundane and boring is Yashodhara’s extremely witty style of writing. She writes with a lot of honesty and candor and has the ability to find humor everywhere – She may not have found the incidents so funny in real life but she does make us laugh with the way she relates them in her book. Another interesting thing about the book are the people who in a movie would be called “character Actors”. This includes the parents and the assortment of household help the couple hires. Most of them are quirky and add an interesting edge to the whole storyline. My favorite is Kajal; the maid Y gets from Delhi to look after the baby. Kajal loves the baby to death but gives us many moments of mirth thanks to her bumbling ways and her attitude towards the Jamai Babu (Vijay) of the house! This is a very good first book by Yashodhara and I look forward to more tales from the Y and V household ! @swaram - yeah the character actors saved the show ! @Shilpa - Welcome here !Yes its a light and breezy read ! @Alka - yes the book does make you laugh ! I enjoyed it against my will, Ruchira! I was prepared to find it shallow, but it was so fun and so believable that I completely enjoyed it! i liked the book too; nice review ! Sounds interesting and a light read. Should get my hands on a copy! To tell you the truth. I have been avoiding this book as the name seems typical love story kind of or doesn't appeal at heart. There had been an impression of being Chetan Bhagat kind of category. However, Yet have no nerve but... I think, I should try. This is the 6th positive review I've read of the book. Looks like I have to pick it up :). @corinne - I was sceptical too ! @MD - Depends on what sort of books you like to read ! @Rachna - its sort of engaging in its own way ! That is a delightfully light and comic book with a bit of spice of life. Perfect diagnosis! The one in which we go under the Knife !